The endless sand, stretching in every direction as far as the eye can see. The unforgiving sun blasts down on my parched, weary body as I stagger on, hoping beyond hope for an end to this nightmare. Damn it all Carruthers, I cant take much more. Oh sorry! That was last years holiday in Weston-Super-Mare. Meanwhile back in Florida. I dont rise until 7:30AM. Hey, Im allowed a lie in, I was up to 11:30PM last night watching the football and drinking beer. Like 7:30 is a lie in! All this early to bed and early to rise stuff is just not right. Breakfast is the closest we come to healthy eating on holiday as it consists of cereal and toast. At 8:45AM the bikes are out again and we cycle off down Middle Gulf Drive. There is a little cycle trail just off Algiers Lane with a nature trail and a small cemetery. We are desperate to see an alligator and everyone has their eyes peeled. The cemetery is tiny and looks like it has been transplanted from the Haunted Mansion. On to Tarpon Bay Road where there is a nature trail called the Bailey Tract. We cycle round but fail to see an alligator. We do see some large black birds circling round and then swooping down into the water to fish and an osprey sat up high and calling to anyone that cares to listen. For a large bird it really does make a lovely sound. India is starting to get tired and complain that her bottom is hurting from the cycle saddle. Disregarding her complaints entirely we push on along West Gulf Drive. Horrible parents, arent we? As Georgia and I cycle along in front, someone shouts from behind and we stop and go back to see an alligator sunning itself on the bank of a small pond right in front of a big hotel. 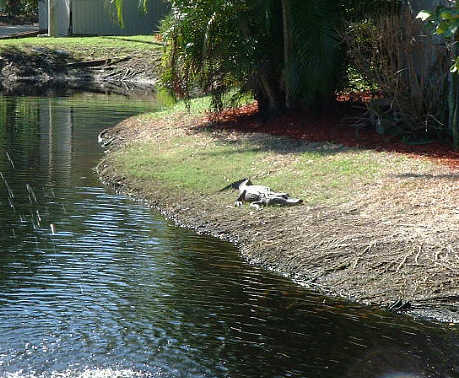 All this hunting for alligators through miles of wilderness and we find one sitting outside a Gulf front resort. Perhaps he was thinking of using the hot tub. Along the road a bit further and we come to the Rabbit Road Trail which winds behind some stunning houses set alongside a lake. Mind you, nearly all the houses here are stunning. Havent they heard of two up, two down? As we cycle along, India suddenly shouts out and we all pull up to a halt in an undignified heap. There in the water is an alligator floating along. At one point he is no more than 10 feet from us. There is something about seeing an animal in its natural habitat that is both thrilling and fascinating. I could watch it all day. Back on the bikes we cycle to a small mall and stop for ice cream. Of course, Tam has to go over the top by having a frozen custard with hot fudge sundae and Reeses pieces. She then confesses that she watched the sunrise this morning while eating a chocolate bar. Pig! The women do a little shopping while I sit on a bench and catch up on my trip report and gaze out at another beautiful, cloudless sky. Back to the condo and I estimate that we have done about 15 miles in 4 hours. This is the perfect place to cycle. Everywhere is flat so your legs dont seem to get tired. The cycle is king here. Whenever a cycle path crosses a road or entrance, the car must give way by law. A short swim and we are refreshed and ready to go again. 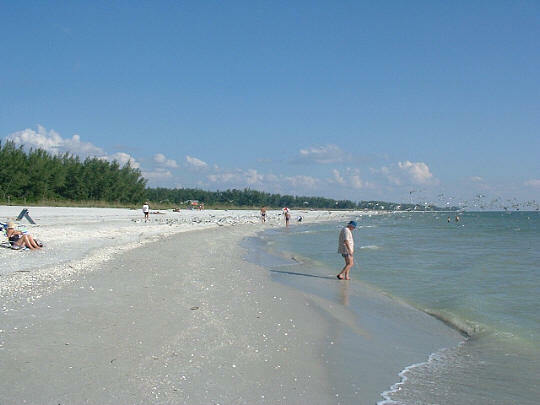 This time we are off in the van to Bowmans Beach, which is supposed to be among the best beaches in South West Florida. You park in a wooded area and cross a river by bridge to reach the beach. It certainly doesnt disappoint, as the sand at the top of the beach is white and powdery. 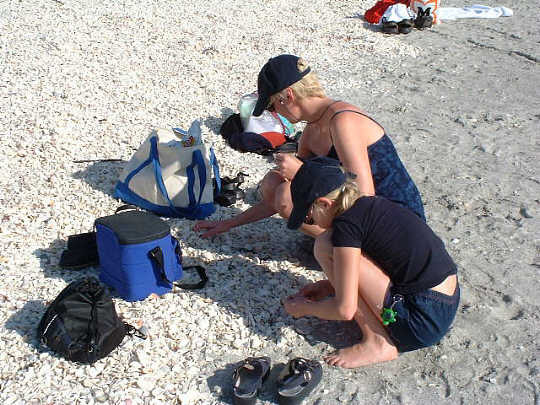 Further down there are so many shells you couldnt begin to count. There are no hotels or condos behind the beach, only trees. The whole effect is of a tropical island. We pass an hour here, paddling and shelling. As we leave, India looks back and says Look a dolphin. We all look but cant see anything. I am just about to tell her she must have been mistaken when a fin breaks the surface and a dolphin arches through the water. We all rush back down to the waters edge and catch the occasional glimpse as the dolphins make their way down the coast. I cant believe our luck. We have seen alligators and dolphins in one day. Back in the van we head to Blind Pass for a quick look around before driving on to Captiva. Now this place is much more compact than Sanibel and actually seems to have an old town centre. We park up at the Mucky Duck and have a drink before wandering into the town for a look around. It is only a small place but there are a number of nice shops and restaurants. The colours are primarily pastel and it reminds me a lot of Key West. It has the same sort of relaxed atmosphere. It is approaching sunset, so we make our way back to the Mucky Duck were we share a pitcher of beer and listen to a man playing the guitar while watching the sun slip lower in the sky. As it approaches the horizon we make our way down to the beach, along with many other people. 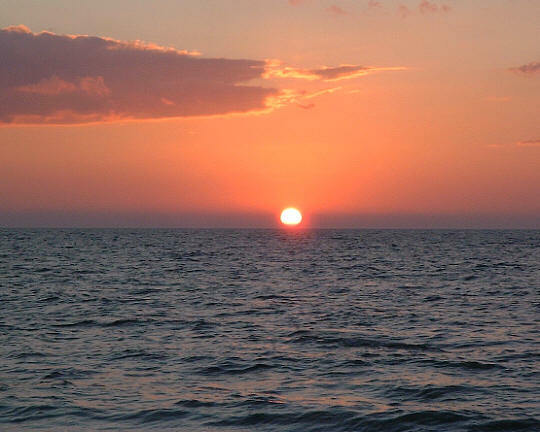 The sky grows redder as the sun slides gently into the sea. I dare say there are better places to watch the sunset, but I havent found them yet. Back at the Mucky Duck we have another half hour wait until our table is ready. When we are seated, Tam has teriyaki steak and I have Captiva chicken. (Chicken with a tomato and garlic sauce.) The food is good but not exceptional. For dessert Tam and I share a walnut brownie with hot fudge sauce. This comes with the usual mountain of ice cream and whipped cream. Very nice. We leave the Mucky Duck at 7:45PM for the 10 mile drive back to our condo. One thing I have forgotten to mention is that the maximum speed limit on the island is 35 mph. This adds to the feeling that you shouldnt rush around, take your time, enjoy the trip. Back at the condo the ladies play cards while I hit the beer and the trip report. My God, is it 9:30PM already? Must be time for bed! Well, it is for the ladies, but I sit on the balcony with a beer and think on life. Then I wander down to the beach and gaze at the stars shining bright in a cloudless sky. Magnificent. A perfect end to a perfect day.